The mobile shade: lightweight when empty so it can be pushed by the farmer into the next paddock, was a source of fun for the herd yesterday. 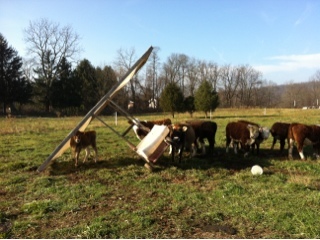 Then Silla, the jersey heifer, decided she needed to rub all over the shade cover. The cover is usually overhead enough that we can barely reach it, now it has bits of cattle fur all over it. Funny thing keeping livestock. From one day to the next we try to stay ahead of them. Yesterday the herd got ahead.